Westminster has two types of scholarship, designed to honour and highlight particular talent in the academic and musical arenas. Those pupils who gain our academic scholarships are known as the Queen’s Scholars, as although the scholarships were originally established by Henry VIII they were more formally affirmed and developed by his daughter, Elizabeth I, in 1560. This historic link with the royal family continues today and our Queen’s Scholars are privileged to be able to attend a variety of special services in Westminster Abbey, as invited by the Dean. Such events have included the wedding of the Duke and Duchess of Cambridge, the visit of His Holiness the 14th Dalai Lama, the Nelson Mandela Memorial Service and the 60th anniversary of the Coronation at which the Queen’s Scholars sang the Vivats. There are a total of 48 Queen’s Scholars, with 12 chosen every year: eight boys at age 13 and four girls at age 16. The Scholars are chosen based on their performance in the entrance exams and interviews and the scholarship lasts for the duration of their time at the school. The fee for a Queen’s Scholar is set at half way between 50% of the boarding fee and the day fee; the Governing Body reviews school fees annually in June for publication by early July. If required, an additional bursary will be awarded on a means-tested basis. Queen’s Scholars are required to board at the school and all belong to College. Those pupils who gain our musical scholarships are known as the Music Scholars. Up to eight 13+ and four 16+ music scholarships may be awarded annually. 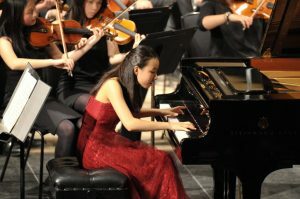 Candidates must audition for the scholarships, offering at least two instruments and demonstrating a high level of general musicianship and great potential for development. In addition to this, as with all other entrants, pupils hoping to gain a music scholarship must also win a place at the school on academic merit, performing well in the entrance exams and interviews. A Music Scholar will receive a 10% remission of the day fee, whether a day pupil or a boarder, and will also receive free tuition on up to two instruments. Similarly to the academic scholarships, an additional bursary can be awarded on a means-tested basis if required. The Henry Purcell Organ Scholarship is awarded to a pupil at Westminster School by kind permission of the Dean and Chapter of Westminster Abbey. The Scholarship is worth 10% of the day school fees and will additionally offer free instrumental tuition on up to two instruments, including weekly organ tuition with the School Organist. The Henry Purcell Organ Scholarship will be awarded to a 16+ pupil and both internal and external applicants are encouraged to apply. External applicants will be required to win their place academically in the normal way. There will only be one Henry Purcell Organ Scholar at any time at the School. Subject to satisfactory contribution and progress, the organ scholar will normally be expected to hold the award throughout their time at Westminster. The intention of the Dean and Chapter in endowing this award is to encourage the promotion in the School of excellent organ playing, both in relation to the liturgy and more widely in performance, and to add a further strand to the strong links which exist between the School and the Abbey. Candidates for the Henry Purcell Organ Scholarship will be required to perform two pieces of organ music of their choice, one by Johann Sebastian Bach, and a contrasting piece by another composer. Both pieces together should not exceed a maximum duration of 20 minutes. Candidates will also be required to sight-read, including playing a hymn at sight, and to undertake a series of short aural exercises. In addition, the panel will give each candidate a short interview. The School’s Director of Music will be assisted in the selection process by both the Organist and Master of the Choristers of Westminster Abbey and the School Organist. The School Organist is extremely well placed to prepare the organ scholar and others learning the organ at School for associate and fellowship examinations, and also for future studies should they wish to continue their organ playing in higher education. The organ scholar will be expected to contribute fully to the musical life of the Westminster community by playing at School functions and services in Westminster Abbey, in the School Chapel, School Hall, at St John’s Smith Square and elsewhere. He/she will have access to organs in Westminster School, Westminster Abbey and St Margaret’s for practice and performance. Where appropriate, the organ scholar will have the opportunity to be involved in the musical life of the Abbey and to work with the Abbey’s own Music Department. Previous experience as an organist is required, and applicants will ideally be at least ABRSM Grade 6 organ standard at the time of audition. For further information, please contact the Music Administrator on 020 7963 1017 or email: musicoffice@westminster.org.uk.